← Job’s Report Reversal or not? What’s the stock market, economy, society, and future all about? It is universally about “people.” The renowned fund manager, Peter Lynch, espoused investing in companies producing goods and services that an individual purchases for themselves. I’ve observed, those investing capital and keeping their pulse on human needs, wants, and activities, over the long-term are rewarded accordingly. When considering people, their existence and well-being, are what’s most important. A better life is measured by contentment with one’s standard-of-living. When it comes to investing money, the objective is to maintain and sustain our present living standards. It is necessary to make sound investments, diversify sufficiently, and not to lose money. Secondly, inflation has averaged about three percent over the past 100 years, it is closer to two-percent at present. Inflation increases costs of food, shelter, energy, healthcare, and many of the products and services humans need for existence. For people to live the life they desire socially and financially, it is important to have investments that historically have outperformed the adverse effects of inflation. 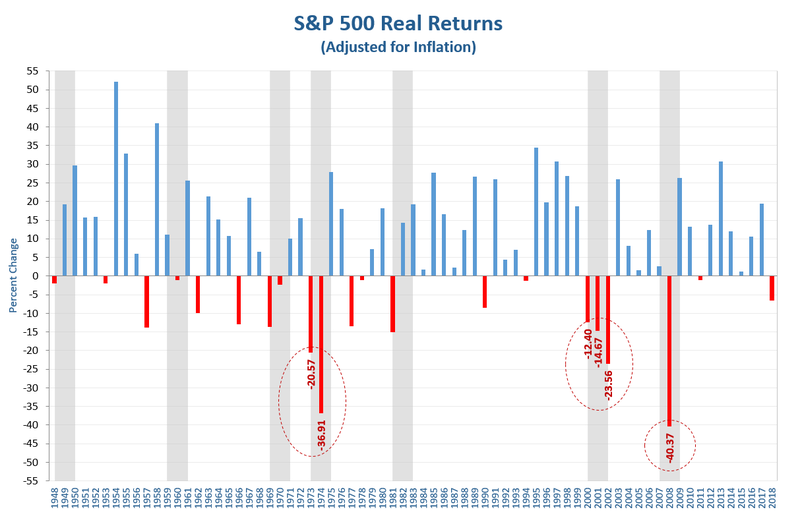 The chart below shows the S&P 500 after-inflation returns yearly since the end of World War II.